We enjoyed a couple of days with Jacob from Canada and then tackled some gravel roads. We started this part of the journey with Jacob. He wasn’t enjoying his trip so far and we were hoping to show him it could be fun. He was two weeks in to his adventure of a couple of months. 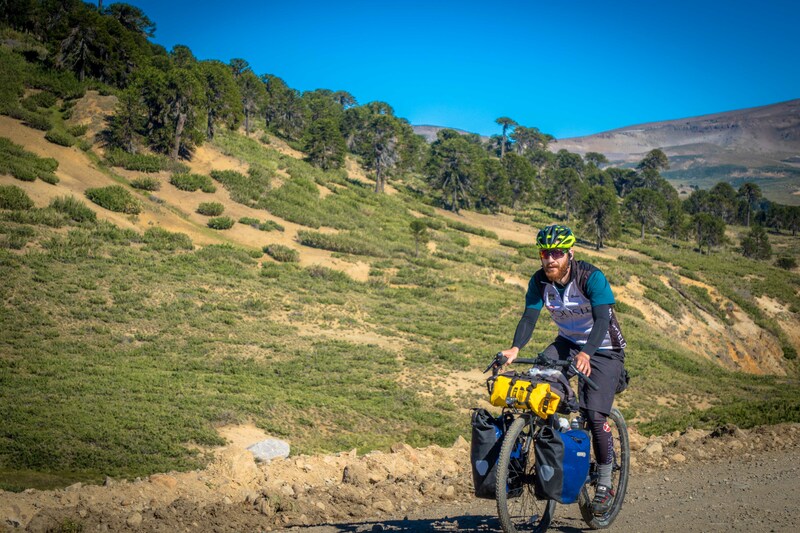 He was at a point where he just wanted to throw the bike off a cliff and fly back to Santiago de Chile and hang out. And while that’s not a bad idea I left on the first day hoping to encourage him. Yes some days are better than others but overall it’s awesome; at least in my books. It was a struggle as even toward the end of the first day he declared he was considering crossing the border we were near and hopping on a bus. While I’m not one to say no don’t do it, I did want him to know that I thought it can be fun. 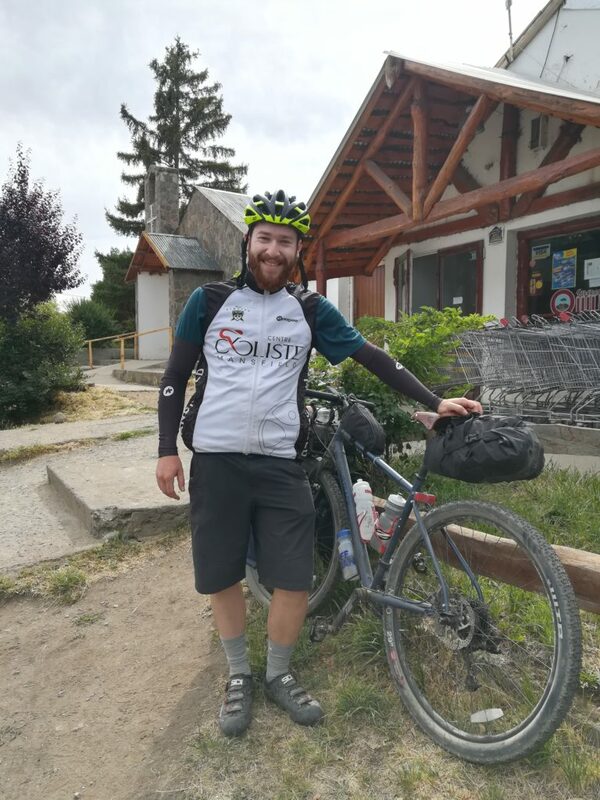 By the end of his internal debate he ended up coming with us with the intention of at least trying to make it to Bariloche and then deciding. It was interesting to cycle with someone with such low spirits and I found myself wanting to listen to his woes. 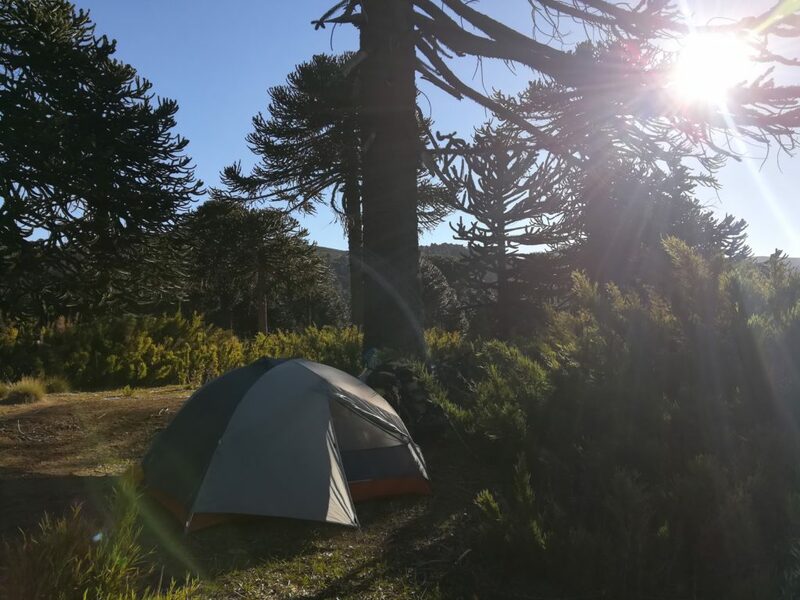 Our camp spot near the Chilean border amongst the monkey puzzle trees. 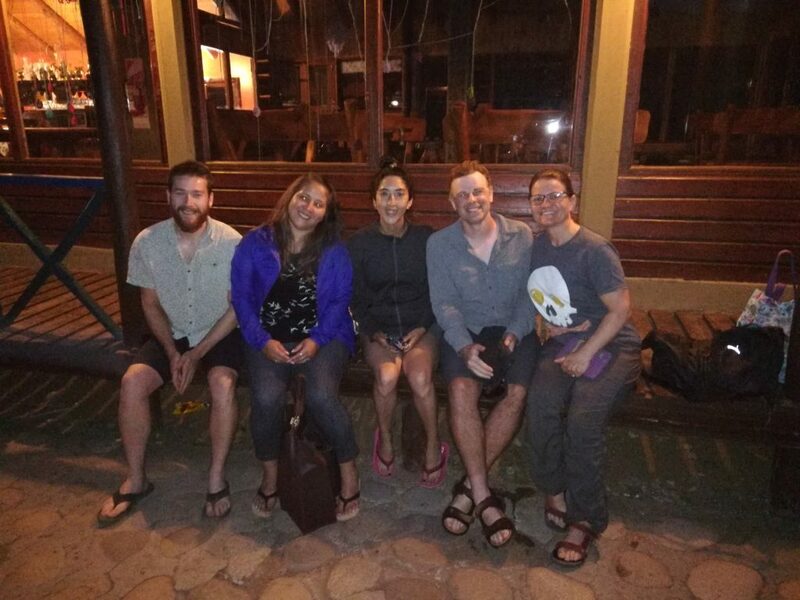 On the second day we made it to a great campground and chatted with some local teachers Tatiana and Daniella. The two teachers we met at the campsite. Most of the day was spent with Andrew and Jacob up ahead. By the end of the day Jacob had declared he was taking a bus the next day. I was left feeling like a failure in trying to encourage him to give it more of a try. Yes this part of the journey was a bit of a drag, but it’s not always like this. At the end of the day it was his decision and I hope he’s happy wherever he ends up. It was great for Andrew to have someone to chat with and cycle faster with. Our beautiful camp spot along the river. On the 3rd day we said goodbye to Jacob as he went to the bus station. So long Jacob; until we meet again. We briefly contemplated getting a taxi because we heard the road was lousy but ended up just doing it. Practice what we preach in that not everyday is going to be awesome. Another great riverside camp spot. Yes it was gravel road, but we did it and somehow it makes the other days seem even better. Some super hard gravel roads. Or soft in this case. 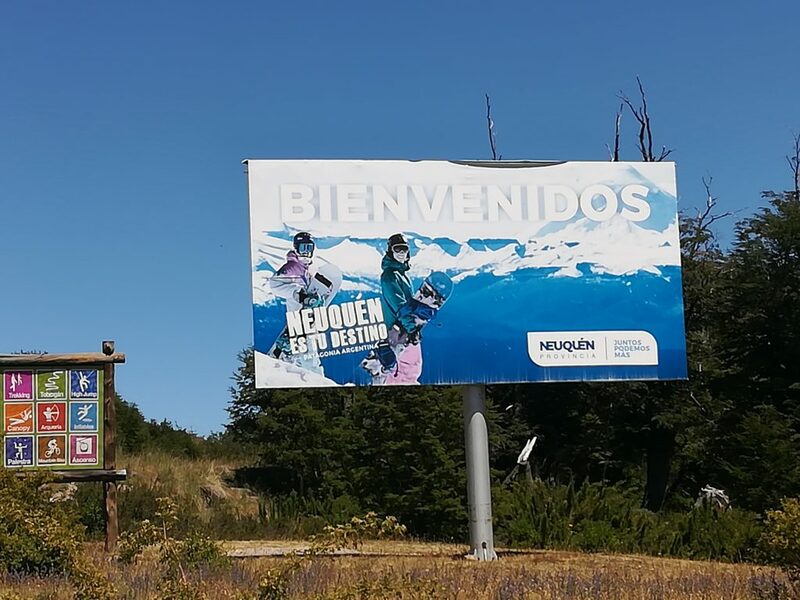 On this day we rolled into a big tourist town of San Martin and wow; instant touristville. So many hitchhikers, buses and families on their annual summer vacation. We were also starting to see other bicycle tourists. We also met a Chilean family that was super excited by our trip and that in itself was awesome. We chatted for a long time and took pictures and they were super fun. We’re in the land of ski resorts which is interesting to see in the summer. Another awesome lake side campground. Andrew writes:Amanda sums up my thoughts on Jacob pretty well. I felt a little bit like a failure because I wasn’t able to provide inspiration to keep him going. On the other hand, we are always preaching that if you aren’t enjoying an aspect of your life, then change it. So Jacob made some changes to produce happiness and I hope that he finds what he seeks. 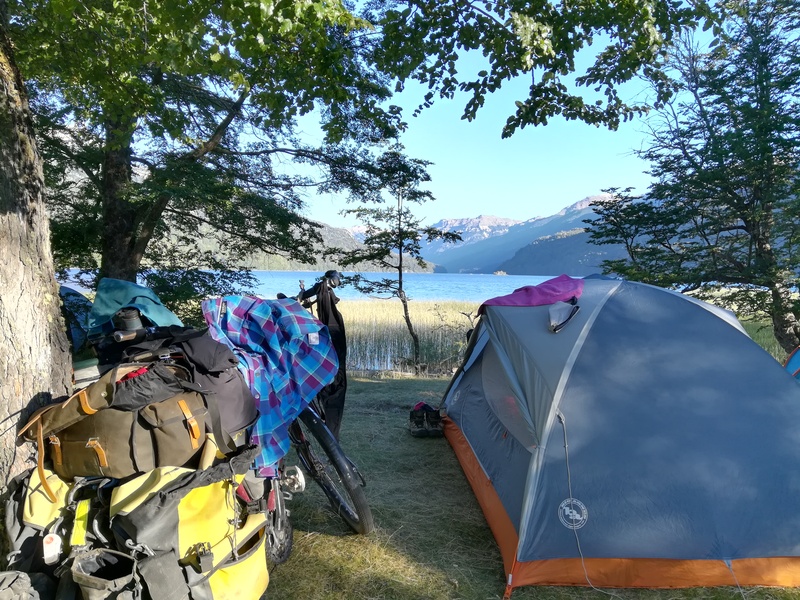 One cool thing that happened while we were at one of the lakeside campgrounds was we met a couple (Laura and Frederico) from Argentina who were on their second or third day of cycling. 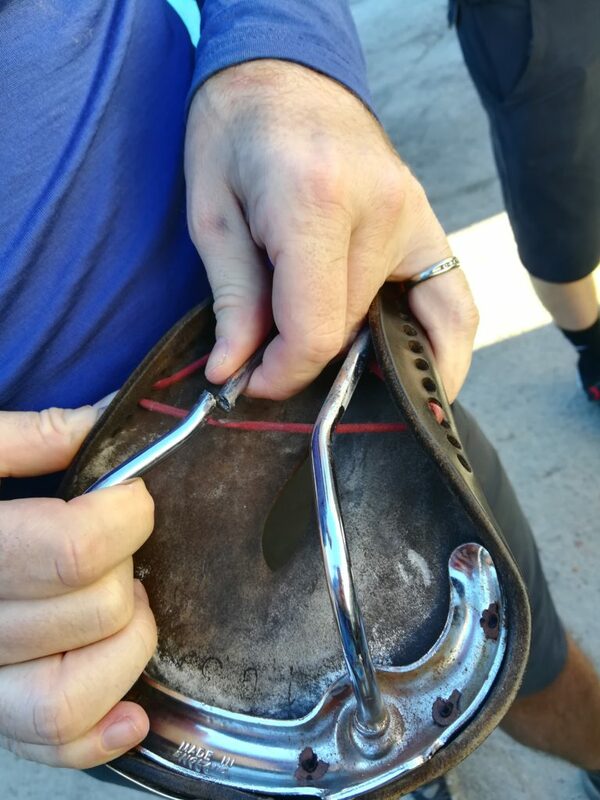 They were bound for Mexico! We met them at about 5pm and they said they had been riding that day for about an hour before stopping at our lake to enjoy some mate (tea). WTF!?!? 5pm and they have only ridden a few kilometers? Their plan was to ride mainly in the evenings when the weather is cooler. Plus they like to sleep in! Who am I to judge another persons travelling habits, but I wonder if they will be able to keep this one up all the way to Mexico. 20-30km a day!? It boggles the mind. Still, they were ultra-keen and so that made us really happy to offer advice to them should they need any in the future. I had been experiencing a sore knee and now I know why! January 22, 2019 Paved for most of the way. Climbing mostly grade. January 23, 2019 Gravel/sand road for almost entire day. It was mostly downhill which was a bonus. Last 15k to campground was paved. There is a junction at about 50k mark which has a small store. 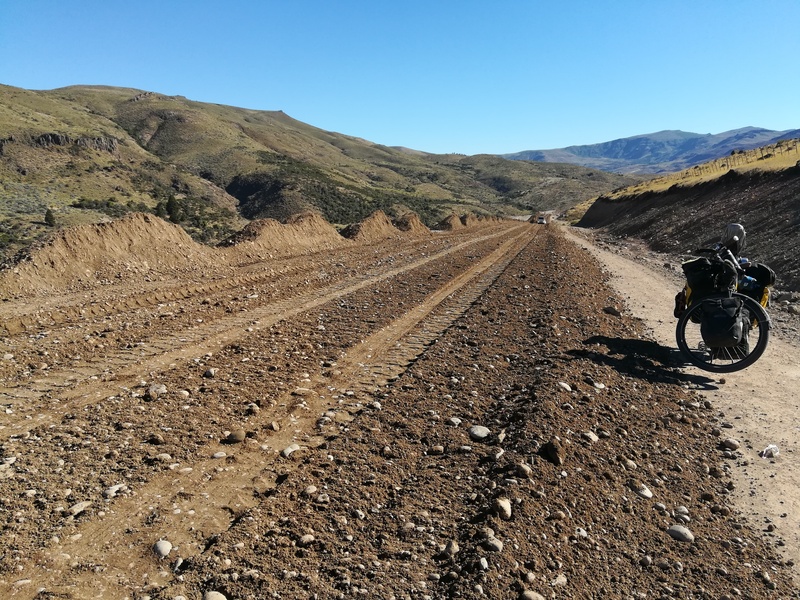 January 24, 2019 Road was gravel but in pretty good shape. Downhill ride almost entire way. There’s a store in Pilol Lil to get food and water. January 25, 2019 Road deteriorated immediately to start the day and there was a 20k climb. Road was so bad at a couple of places we had to walk. January 26, 2019 Lots of hills up and down after you reach San Martin. First 20k to San Martin is pretty flat. Lots of traffic and no shoulder. San Martin is tourist town with lots of stores and hotels. 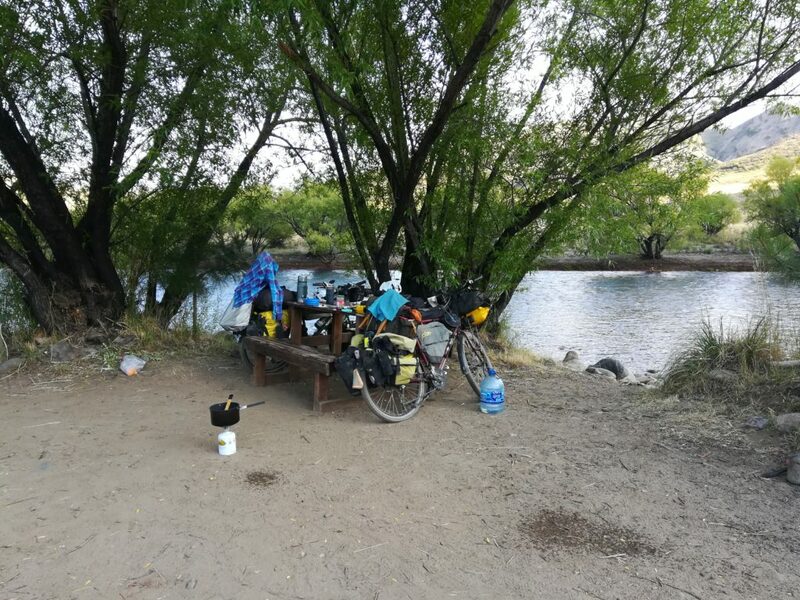 January 22, 2019 We camped near Creek after turnoff before Chile border crossing at iOverlander spot. 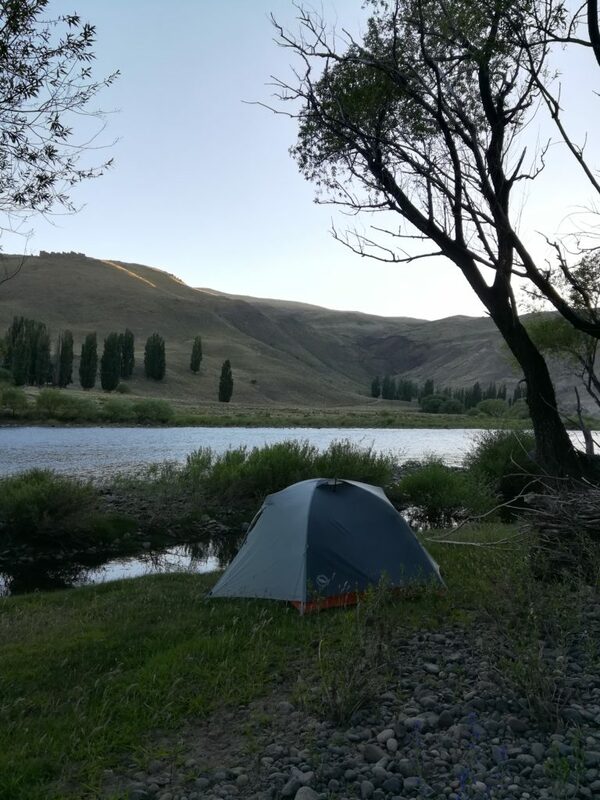 January 23, 2019 Really nice campground listed on iOverlander just outside town. January 24, 2019 We camped just past the little town along the river. January 25, 2019 Busy town and we got the last beds at the second hostel we went to. 400 per person and shared room, bathrooms and kitchen. January 26, 2019 Stayed at campground along lake for 300 pesos per person. Across the street and 500 meters further is a free campground with no toilets or showers. The toilets and showers at ours were not great and we would recommend going free. So enjoying your journey through beautiful Argentina and do you ever meet some interesting characters along the way! It’s nice when the companions that share the road with you for a few days remain your friends forever and as I’ve followed you sometimes you meet up with them again in another country! Take good care friends!